This lovely salad can be made ahead and is great to serve with other salads for a party or barbecue. Vegetarians will be happy too with this complete meal salad. Leftovers are very good for lunch the next day. Be generous with the herbs as they really make it, I like to use about two cups of chopped herbs. You can also add a diced Lebanese cucumber or a yellow pepper (capsicum) for colour and crunch. If using a can of lentils simply drain and rinse. Pick over the dried lentils and remove any pebbles or husks, then give them a good rinse. Place in a saucepan with plenty of cold water, no salt and bring to the boil. Turn down the heat and simmer until tender. This should take about 25 minutes. Drain. Soak the currants in hot water for 15 minutes to make them plump. Soak the chopped red onion in cold water for 15 minutes to remove the sharpness. Drain and pat dry. Meanwhile bring a large pan of water to the boil, add salt and cook the pasta until al dente or for a little less time than suggested on the packet. Drain and toss with the tablespoon of olive oil and set aside to cool. Combine the dressing ingredients in a jar and whisk or shake well. Taste and adjust keeping in mind that the feta and olives are salty. Place the lentils, currants, onion, pasta, olives (or use for garnish) and feta in a large bowl. Pour the dressing over the ingredients and toss to combine. Using a sharp knife cut the herbs fairly finely and mix through the salad. Keep in the fridge, covered, until needed and add the tomatoes at the last minute. Taste and make any adjustments needed. 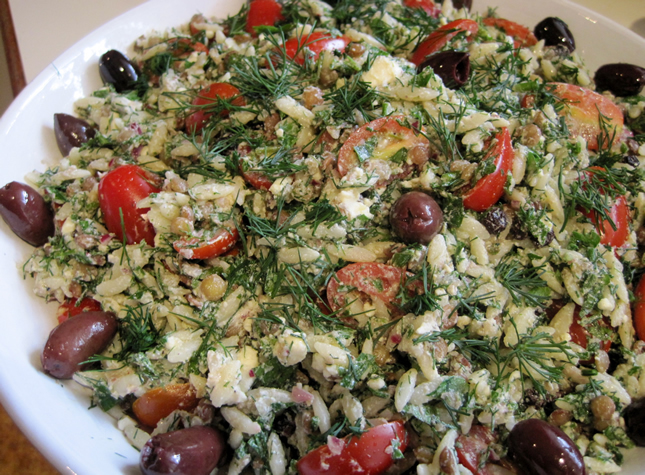 Tip into a salad bowl and decorate the top with tomatoes, olives, feta and herbs or as you wish. This looks simple, refreshing and very yummy. Definitely one to try.